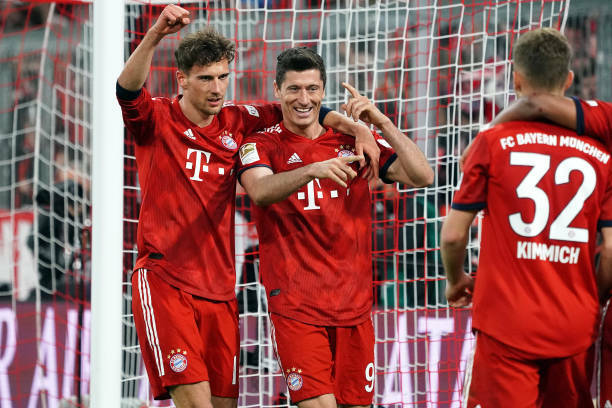 Bayern Munich took a big step towards winning a seven th straight Bundesliga title by thrashing Dortmund 5-0 in a crunch clash at the top of the table. Bayern overtook Dortmund by one point and with Robert Lewandowski in good form,Niko Kovac's men will now take some stopping in the final six matches. Robert Lewandowski bagged two goals against his old club and his opener in the earned the Pole a 200th strike in Bundesliga to join an elite club. They were made to pay as another former Dortmund player, Mats Hummels, headed home the opener from a corner. An understandably much hyped affair given the importance of the match, the 100th Bundesliga "Klassiker" was realistically over when Lewandowski made it 2-0. Centre back Dan-Axel Zagadou seemingly didn't spot a lurking Lewandowski and his pass was intercepted by the front man, who then beat Roman Burki with a typically composed finish. Javi Martinez and Serge Gnabry made it 4-0 prior to the interval and Lewandowski tallied his second in the 89th to give Bayern a staggering 22 goals in their last four games. at the way we played at the start of the season and we showed that today."